In a previous post about blondies I brought up the age old debate about blonde vs. brunette. 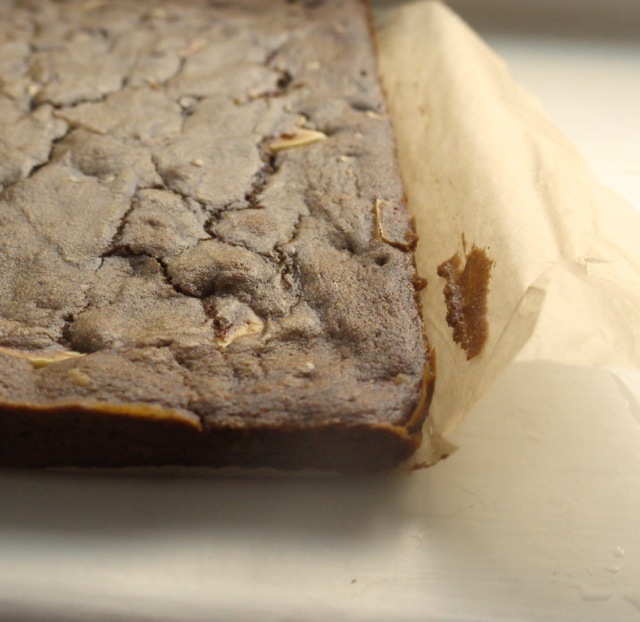 Blondes, they say, have more fun but in the edible stakes, brownies definitely have the upper hand. 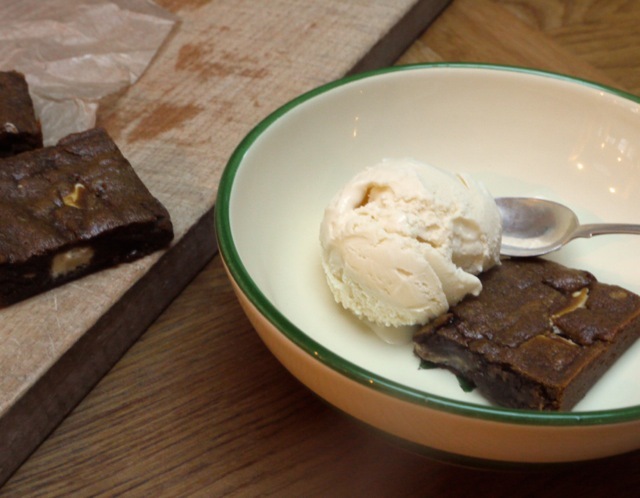 There are far more recipes for brownies than blondies on this blog, and if you cast your net wider to google, a ‘brownie’ search returns 45 million results; blondies fewer than 2. But what about that elusive third category, the much-maligned, often forgotten but every bit as delicious ginger? December is the time to bake with winter spices. I’ve been adding cinnamon, ginger and nutmeg to almost everything these past few weeks and wanted to share a recipe that celebrates their warmth. There’s a pretty delicious recipe for gingerbread biscuits we’ve been eating on repeat, but I’m shamelessly saving it for my cookbook. Luckily being unable to post it meant I’ve been a little more creative in the kitchen and these gingerbread blondies are the result. Making a brownie without chocolate (or dark chocolate, at least) is always going to be a rich affair. It’s a delicate balance between butter, sugar and just enough flour to hold the whole thing together with a taste and texture not a million miles from fudge. Sometimes I like to counteract that sweetness with sharp dried cranberries or salty roasted nuts, but in the spirit of all things festive, here I’ve added creamy white chocolate chunks to amp up the indulgence. A generous pinch of warming winter spices and a spoonful of molasses gives all the gingerbread flavour you need in an altogether more indulgent mouthful. Perfect served warm with ice cream or packed in a lunchbox for a mid-morning pick me up once the Christmas party season is in full swing. 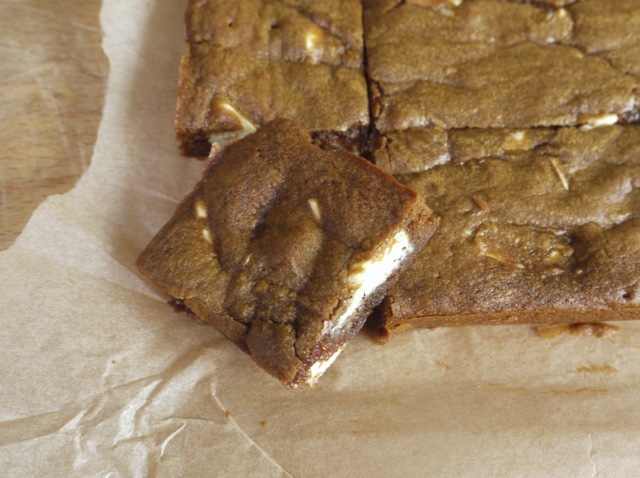 Chewy, gooey blondies with packed with warming winter spices and chunks of creamy white chocolate. A bar to rival the very best brownie. Preheat the oven to 180 degrees C/Gas mark 4. Grease a baking tin approx. 20 x 30cm with butter and line with baking parchment. In a medium bowl, sift together the flour, spices, baking powder and salt. In a separate bowl, whisk together the sugar and egg until smooth and creamy. Whisk in the molasses followed by the cooled melted butter. Continue whisking 2 - 3 minutes until pale and thick. Fold in the flour mixture, followed by the white chocolate chunks, then spoon into your prepared tin, spreading flat with a spatula. The mixture will be fairly thick - stickier than cookie dough but definitely too thick to pour. Bake for 20 - 25 minutes until set around the edges and a skewer inserted in the middle comes out slightly gooey. Remove from the oven and leave to cool completely in the tin before slicing into squidgy squares. I don’t really know how to articulate this but the very fact that you posted these on this day, December 1st, fills me with such festive related happiness. These are just gorgeous, I recently made 60 gingerbread men for the office so I was a little sick of ginger but these have deffo revived my love for it. I am such a sucker for a gingerbread and white chocolate combo. These blondies look fabulous! So chewy (exactly how I like bars)! Yes! They’re chewy and squidgy, even more so if you keep them in the fridge. I’ve made a similar blondie recipe because I just love the ginger–white chocolate combo (I use it in a spicy cookie too). 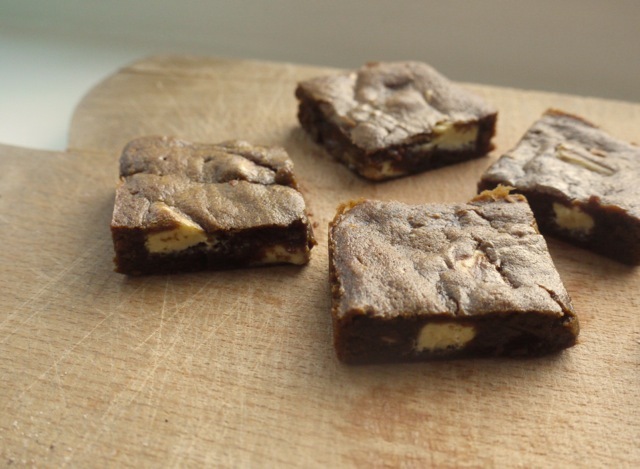 These would even better because they call for much less leavener, which means fudgier bars! I can imagine how wonderful these would when paired with ice cream! I’m ready to ring in the holiday season. I never would have thought to combine these flavors, but it sounds amazing! Oh my goodness these are the most divine tasting things I’ve ever tasted and I think that every time I make one of your incredible recipes, but really this time! Wow just wow. I didn’t even think I liked ginger that much but after baking these as a way to distact myself from work I think my ginger jar will be finished pretty quickly. Wow, that was quick – you made them already? So pleased you liked them. nothing like the smell of holiday spices! it’s funny, i don’t use white chocolate much until i bake in the winter. it just seems natural. and what a perfect fit for blondies. I love gingerbread – I just know I would love these! They look magical! 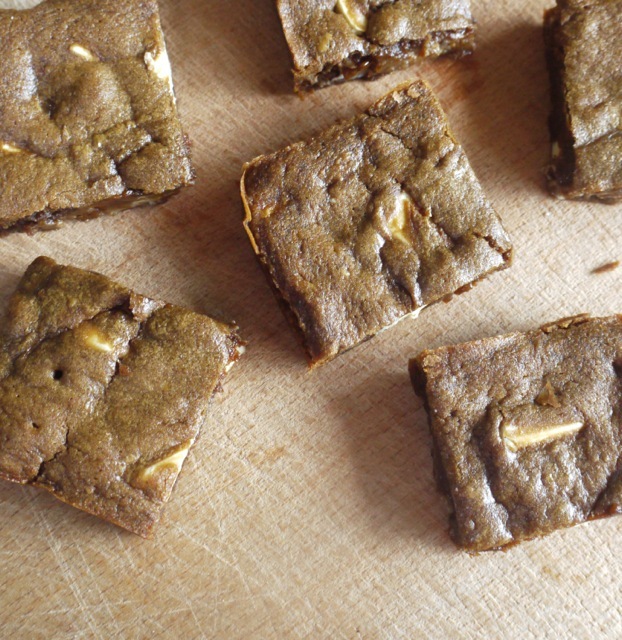 Anything with ginger in it gets a big tick from me – these sound delicious Kate! I haven’t had a blondie for years but I can’t think about anything other than this version! Gingerbread + white chocolate is such a good combination and I love how squidgy these look. I’m definitely making these asap! Definitely making these for a Christmas drinks party I’m having in a couple of weeks! Sometimes you can’t beat a good blondie – I always think they’re a bit more interesting than brownies with more potential for interesting flavours (I like raspberry, white choc and pistachio). Love how glossy and delicious yours look! Wow they look delicious – so chewy! I love the combo of spice and white chocolate. I will definitely be trying this. Thanks! Wow, these look/sound amazing! What would you substitute molasses with if you didn’t have to hand? Honey?! Can you tell me what temperature these should be baked at? So sorry, it’s 180 degrees C, gas mark 4. I love the mix of gingerbread with chocolate. I’m not usually a big fan of gingerbread alone, but the chocolate makes it a much more interesting experience. Thanks for sharing these beautiful recipes.